Is it possible that the Vice Chair of the Senate Intelligence Committee, a guy who enjoys raising a glass or two of the vintage, might be in collusion with a popular language website for the purpose of giving us a heads-up about some major events to come? Probably not, but it would make a good story if it were true. The only major collusion going on these days seems to be with the ever-bloviating Sean Hannity of Fox News, along with that other intelligence committee headed by Representative Devin Nunes, the stalwart Trump defender who is otherwise incapable of displaying any intelligence. On second thought, you might want to add Ohio Congressman Jim Jordan to that colluder list. But Jordan has problems of his own to wrestle with right now and is busy avoiding the spotlight. Whether it was coincidence or not, two occurrences last week served to alert many Americans that the headlines they’ve been reading for the last year may be just the tip of the Trump-Russia Scandal iceberg. Perhaps a few glasses of wine imbibed by a senator, along with a few words posted on a language website can, in a unique way, help Americans become more informed about their government and the crisis it faces as the SS Trumptanic heads full speed ahead into the abyss. Yes, buckle up, for your safety and that of our Republic. Political junkies, listen up. 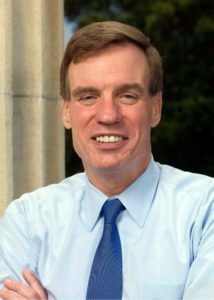 It’s time that we all chip in and buy Senator Warner lots of wine to help loosen his tongue. And how appropriate that he’s enjoying the bounty of the vineyard on, of all places, Martha’s Vineyard. There is no doubt that the Senate Intelligence Committee mainstay knows a lot more than what he’s said so far. Unlike his House Intelligence Committee counterpart, Devin Nunes, Warner is much more intelligent and knows that he needs to keep his mouth shut for just a while longer. The just-released Senate Intelligence Committee report is Exhibit No. 1 about the stupidity of the House Intelligence Committee Chair and its exoneration of Dear Leader, Donald Trump. But how can you keep your mouth shut while you’re enjoying that third glass of Malbec? The second seeming coincidence followed the senator’s Cape Cod party by just two days when the popular language website Wordsmith ran a week’s worth of words for its daily feature, A.Word.A.Day. (AWAD). And what a choice of words to run. Malfeasance. Nepotism. Emolument. Collusion. Impeach. The category chosen for the week by AWAD’s long-time editor and founder, Anu Garg, was words from politics. 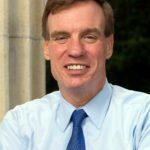 We can only hope that Senator Warner will have more to say about the subject of trouble right there in DC, the fabled swamp adjoining the Potomac and that rhymes with malfeasance, nepotism, emolument, collusion, and the big one: impeachment. In the meantime, we must thank Anu Garg for helping to school the American people about the meaning of these five words from the politics category. 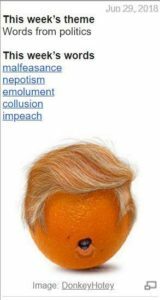 There is no doubt that given the increasingly erratic course of the SS Trumptanic, millions of our fellow citizens should familiarize themselves with these five critical words and their meanings in the months to come. Mr. Garg, are you now or have you ever been in contact and in collusion with a certain Mark Warner? So while I’m waiting for all of this to happen, I must go and refresh my glass of Malbec. And Pinot Noir. With apologies to W. C. Fields, at this point, I would say that in these most perilous of times, everyone has to believe in something, and I believe I’ll have another glass. PS – Dear Reader, you must know that we live in a bipolar world, where we experience opposites such as good and evil, night and day, and hope and despair. You are invited to sign up for a free subscription to Wordsmith and its feature, A.Word.A.Day, For in that same bipolar world, there are Wordsmiths and there are Smithworders. I’ll leave it at that.